Messengers from the early days of the internet are falling like nine pins. A year after Yahoo had announced that it was shutting down Yahoo Messenger, Google has said that it’s retiring its iconic chat messenger Google Talk. Over the last few years, Google has been gently nudging its users away from GTalk, replacing it with its Hangouts messenger in both GMail, and taking its app off the Play Store. But over the next few days, the last few GTalk users will be invited to move to Hangouts, and after 26th June, the service will be shut down entirely. This will mark the end of an era, for Google Talk had become one of the most popular chat clients in the second half of the last decade. GTalk had been launched in 2005, and excitement around the service had been high – bloggers had found a way to access it before it had even been released to the public. After its release, it had quickly provided itself as a viable alternative to the biggest chat messenger at that time – Yahoo Messenger – and had quickly garnered lots of users, particularly in India and Brazil. In 2006, Gtalk had also been integrated with Orkut, the dominant social network of the time. It had later gone on to include group chat capabilities, allowing users to talk to multiple people at a time. 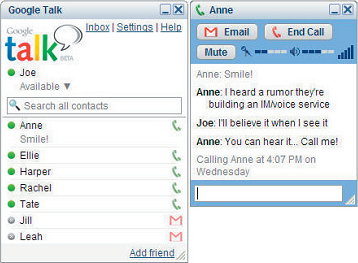 In 2008, Google Talk had introduced video and audio chat options. There had also been plans to integrate it with Skype, but Microsoft’s acquisition of Skype had likely scuppered those plans. In 2013, Google had announced Hangouts, and had gradually begun phasing out GTalk. In 2014, Google had dropped support for XMPP that powered Google Talk, and in 2015 had discontinued work on its Windows app. Since then, Google has further expanded its messaging strategy, developing Allo and Duo for consumers, while positioning Hangouts as an enterprise solution, which could possibly be split into Chat and Meet. The old timer, Google Talk, clearly found no place among this plethora of new apps. But the app will carry fond memories for a generation of internet users who’d made Google email accounts, drawn by its near-unlimited storage compared to rivals like Hotmail and Yahoo. For these new Google converts, Google Talk had become the chat client of choice, thanks to its clean interface and its no-nonsense approach to chat. While Google Talk is no more, it will be remembered as the client the paved the way for the more sophisticated clients of the future.